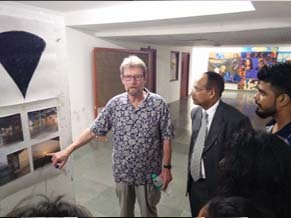 Prof. Jon Jicha, School of Art and Design, Western Carolina University (WCU), USA has visited Amity School of Fine Arts, Amity University, UP for a period of 6 weeks (during Sept.- Oct. 2017) for Artist and Residency programme. During his visit he had strategic discussion with Prof.(Dr.) Pradeep Joshi, Director General, Amity Directorate of Applied Arts/Fine Arts/Performing Arts/Visual Arts for “initiating activities for strengthening relationship between Universities”. 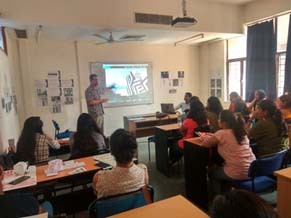 The objective of inviting International Artist to campus was to provide learning with International perspective in the field of Art & Design to faculty and students. “Faculty Development Programme” for faculty of Fine Arts/Performing Arts/Visual Arts/Applied Arts was organized on theme “Design Learning Communities & Pedagogy” & “Facilities Management/Changing conditions for Art & Design”; which immensely benefitted faculty members. 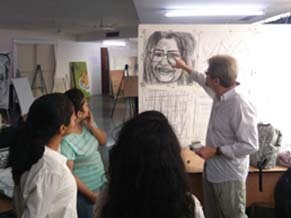 Prof. Jon Jicha has also conducted workshops for faculty and students of Painting and Applied Art discipline. 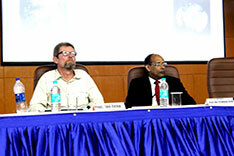 Students got opportunity to work on live projects with International faculty. “Talk show” for students of Faculty of of Fine Arts/Performing Arts/Visual Arts/Applied Arts and “interaction with International students of University” was also organized during his visit. 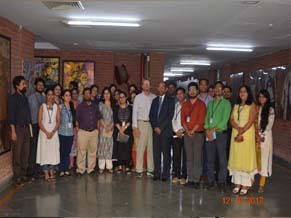 An International Faculty Development Programme was organized by Prof John Jicha for Amity School of Fine Arts & Amity School of Fashion Technology under Amity Directorate of Applied Arts/ Fine Arts/ Performing Arts & Visual Arts on “ Design Learning Communities/ Padagogy” on 12th October 2017 between 2:00 p.m. to 5:00 p.m. Professor Jon Jicha started his lecture by sharing few examples of the curriculum system adopted by the Western Carolina University. 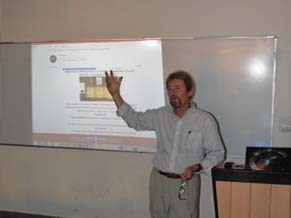 He focused on the syllabus of Applied Art department of Western Carolina University and discussed about the pedagogy in detail. The presentation also focused on the evaluation and grading system which actually categorized different module based evaluations. He spoke about how his university takes into consideration different stake holders while reviewing the syllabus. The importance of understanding cultural contexts while setting up academic environments was also a key highlight of the lecture. 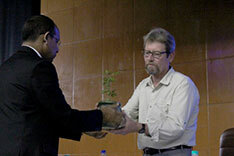 The lecture ended with a constructive discussion session with the participants. 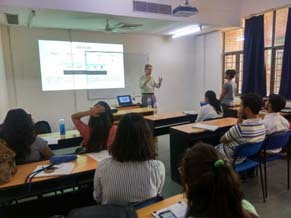 Prof. John Jicha, Professor of Art and Design from Western Carolina University, USA gave a talk on 12th September, 2017 focusing on the interface between art and design studies. Prof. Jicha’s presentation focused on how commonplace visuals get transformed in a work of art in different contextual situations. His presentation informed the audience about how visuals can transcend the boundaries of space, time and culture and evolve into a universal language. Prof. Jicha showed some cutting age works by few of the major artists of 20th century and drew visual analogies with his own visual experience in India, where he had photographed different commonplace structures and arrangements in different public spaces. His talk was enriching and enlightening. 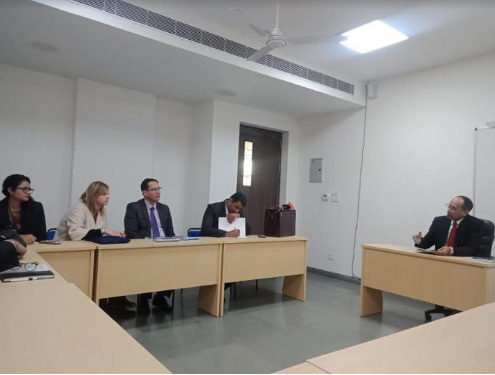 Prof. Tony Travaglione, Pro Vice Chancellor & Executive Dean, Mr Nimay Kalyani, Lecturer International Coordinator- South Asia, Dr Tony Drew, Asst Dean International from NEWCASTLE University & Sara Gentili, PhD. Student Recruitment Coordinator LUISS Business School. Director General ASFA, ASFT, ASPA discussed about various programmes offered by ASFA & ASFT and also highlighted areas where international collaboration can be initiated between colleges. Meeting was also attended by international coordinators Ms Smita Bagai,ASFT & Mr Varun Sahai, ASFA.